Among the highlights from his trip, according to his 8a scorecard, are flashes of 3 V11s and repeats of The Vice (V13) and Golden Shadow (V14). These are Caballero’s 3rd V13 and 2nd V14 respectively. 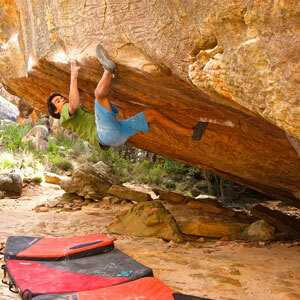 The moves on this boulder are quite powerful and require good body tension. The first three moves revolve around a tension heel-hook with three right-facing slopey crimps. Then immediately after that you get a left toe cam and do three powerful slaps on slopey crimps and slopers. Finally, for the last hard move you throw with a bad heel hook for your right foot and an OK sloper with your right hand, to a left hand pinch. You finish off the boulder with an easier top out.